Capacitors C1 to C6 inclusive should be polyester or polycarbonate +/- 5%. Hi-k ceramic types are not suitable. Stages may be cascaded for additional stop band attenuation or different bandwidths. A similar format filter may be used for CW with the values scaled to reduce the passband to say -6dB at 600Hz and 1500Hz. R2 and R3 will need to be recalculated for the new filter values. R1 is always half of the value of R2 to maintain an overall in-band gain of X1. Equivalents to the BC109 may be used but they should have low noise and high hfe. Resistor R3 provides the correct terminating impedance for the m-derived pi section low pass filter. 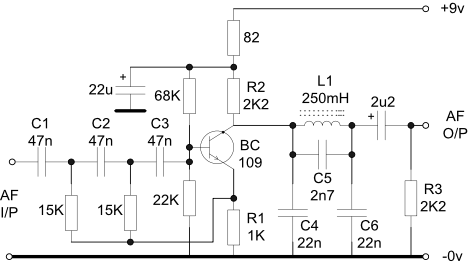 The following stage should have a much higher input impedance to avoid loading the filter. 1. This filter, as shown, has been designed to have a bandpass characteristic with an overall gain of one and a frequency response of -6dB at 300Hz and 3KHz. The 9v supply does not need to be stabilised but should be hum and noise free.